It is often assumed that a Ph.D. in physics is only useful if the recipient is going to become a professor someday. However, only ~15% of Ph.D. recipients will end up in tenure-track faculty positions! What this means is that the vast majority of Physics Ph.D. holders work in other fields, supported by the consistently lower-than-average unemployment rates for science and engineering Ph.D.s. Indeed, a Ph.D. in physics is excellent training for a wide variety of careers in education and research, including in academia, government, industry, and finance. Some of the most important skills learned during a Ph.D. in physics can be translated to almost any career, such as solving challenging problems, mathematical modeling and analysis, and oral and written presentation. 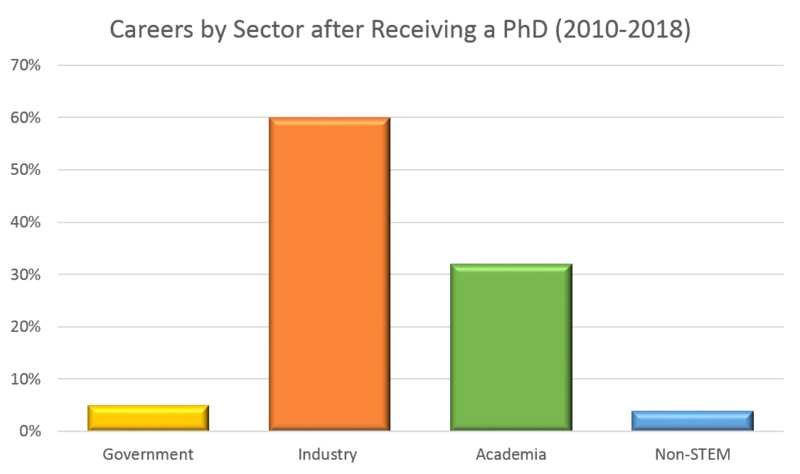 Broadly speaking, physics Ph.D.s can be found in academia (50%), government (14%), or industry (30%). 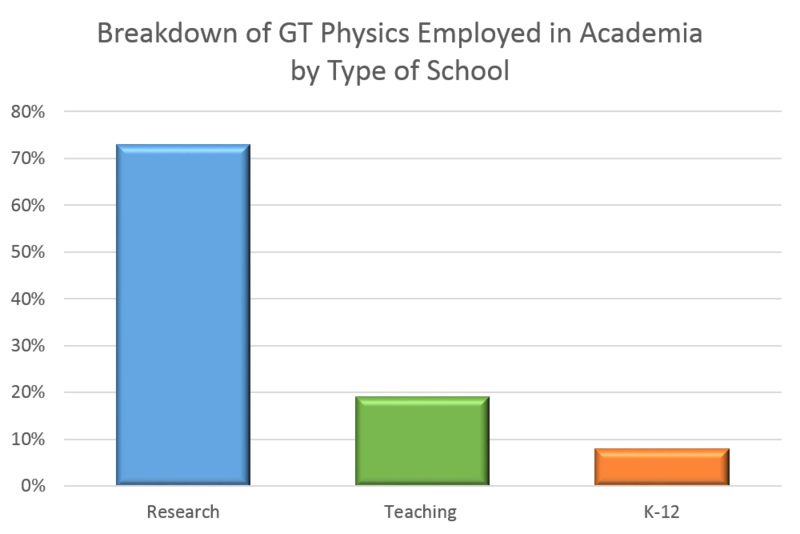 Recent Georgia Tech Physics Ph.D.s (since 2010, a total of 110 students) echo these numbers, as seen in the chart below. These graduates have gone on to faculty positions at John Hopkins, Michigan State, and others; companies such as Intel, Google, and Texas Instruments; and US national labs. Non-STEM jobs include fields such as consulting and data analysis. For those GT Ph.D. graduates (post 2010) working in academia, we find the majority are at research-focused colleges and universities. While a few of these include the roughly 3/4 of new Physics Ph.D.s in a postdoc or similar temporary position one year after completing their degree, practically all transition to permanent employment over time. Although GT Ph.D. graduates have a good track record of finding employment in industry and academia, this does not mean the way there is necessarily obvious. For more information, consult the resources listed below. Also, take advantage of Georgia Tech's Center for Career Discovery and Development. They will help you craft a resume, find opportunities, and even explore possible career paths. Finally, be sure to check out Versatile PhD. This resource for exploring non-academic careers has job postings, panel discussions, success stories, and an online community. 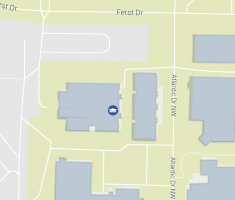 Georgia Tech pays for all the premium content on this site as well!